The Active Arthritis Gloves are designed to help individuals maintain a healthy active lifestyle while relieving aches, pains, and stiffness associated with arthritis. The unique design provides mild compression for warmth and to help increase circulation and promote healing. The Active Arthritis Gloves are made of a soft breathable Cotton material and anti-slip design strategically located on fingers and palm provides excellent grip. These Gloves are so comfortable that you can wear them all day and night. The open fingertips allow you full freedom to feel, touch, and grip. 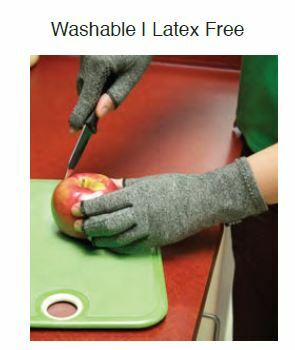 Use the Arthritis Gloves for arthritis, hand fatigue, cold hands, other types of hand and wrist pain. 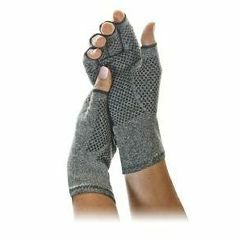 Arthritis Gloves may also help with neuropathy of the hands and poor circulation. My husband has arthritis.. His hand is also very . swollen from having a . stroke. He wears this. this glove and it helps. with the pain and the. swelling..
My husband has arthritis. His hand is also very swollen from having a stroke. He wears this this glove and it helps with the pain and the swelling. I recommend it to any one with swelling or arthritis. Not the relief I was hoping for. It's comfortable but doesn't provide as much relief I was expecting. Releived hand pain. Reduced hand swelling. Able to grip items better. Wear daily, helps reduce pain &amp; swelling, able to grip items better without dropping. Planning on buying a 2nd pair to alternate wearing &amp; allow for washing. Relieve paoin. Relieve pain. Help Trigger finger. Recommend highly. Sleep at night assured. Keeps trigger finger stra. Recommend highly for comforting Arthritic hands, trigger finger and pnuropathy. I wear the gloves day and night. I have purchased 6 pairs already. 6 of my friends have also purchased the gloves. 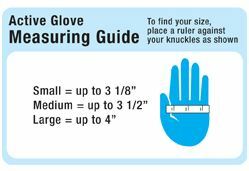 What is the difference between Active Arthritis gloves and Arthritis gloves. They look the same but have different prices. Why? For work, which model provides durability or should an outer glove be worn?